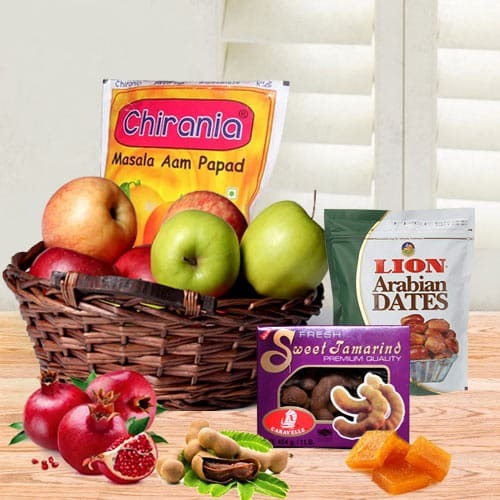 Online delivery of best wishes along with this Magical Seasons Fiesta Fruit Gift Basket for your dear ones. Celebrate any Festival in style with this delightful Hamper comprising with Pears - (1/2 kg. ), Red Apple - (1/2 kg. ), Sweet Tamarind, Dates - (1 kg. ), Aam Papad Chocolate - (20 Pieces), Pomegranate - (1 kg.) and Green Apple - (1/2 kg. ).